New Jersey surplus lines producers, IPC filers, and insurers may begin reporting policy data electronically to the Department of Banking and Insurance on April 8, 2013. 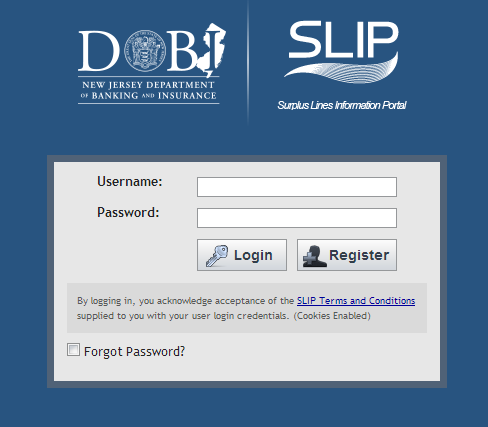 The Surplus Lines Information Portal (SLIP) provides a mechanism to report, view, and edit policy data online. DOBI strongly encourages reporting entities to report all policy data effective 1/1/2013 forward through SLIP. Report policy data by (1) entering the details on the New Policy screen or (2) uploading a single XML file, containing as many policies as necessary to complete the filing. Search, view, and endorse policies. Create reports, including the certified tax filing report and payment voucher. Create user accounts for designated staff to report data for the company. Receive correspondence from DOBI through the SLIP Inbox. DOBI will email login credentials to NJ surplus lines producers and their designated administrators. If you do not receive this email by April 19, please call 609-292-5350 ext.50426 or email sleo@dobi.nj.gov. IPC filers may register for credentials through SLIP. Simply click the "Login to SLIP" button above and follow the prompts.